Terex Compact has announced that it will launch six new mini excavators from 1.4t to 3.7t at this year’s Bauma exhibition. New exterior design, operator-focused workstation and modern excavator controls are highlights of the models. 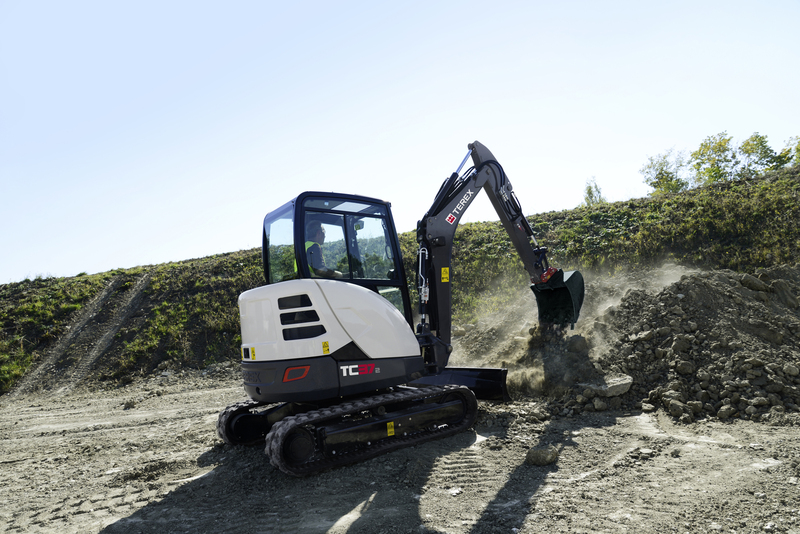 The new line up for the European market includes TC14-2, TC16-2, TC19-2, TC22-2, TC35-2 and TC37-2 mini excavators; followed by other models within the next 24 months. This is the biggest new product development offered by the factory at Crailsheim in Germany. Results of performance tests carried out by Terex show that the new models offer up to 20% more work performance on average (faster trench digging times) compared to competitors' models. The new minis are equipped with LUDV hydraulics (load-independent flow distribution), the technology offered in very few models in this size class. The LUDV enables power to be transferred to the implements as the operator demands. Even when working with hard soils, the bucket offers outstanding ground penetration. Its conventional design ensures that the machine remains stable even on rough terrains. For the precise control of attachment tools such as hammers or cutters, the second auxiliary circuit is operated with electrically proportional control, a standard feature offered on TC22-2 and larger models, optional in the smaller models. The operator will enjoy precise joystick control (Terex Fingertip Control),a feature which is usually implemented in higher-ton class excavators. Furthermore, an extra-large diesel tank enables many hours of uninterrupted work. The new models in the 1.5t class offer a cabin with second door on the right for additional entry/exit – an advantage for road construction and good for direct communication and visibility to the right-hand side. The new XL cab offers the space and comfort of a 3.5t machine. For quick entry, the console can be raised for more space to get in the cab. The large foot pedal offers additional space for larger shoe sizes. In general, the workstation can be conveniently adjusted to the operators preferences. The large glass surface offers best view of the attachment tool and working environment; the track below on the right is particularly easy to see. The combination of intuitive control and safe working environment makes the machine user-friendly. Thanks to Terex design features, damage is prevented before it occurs: the top-mounted cylinder cannot be damaged when loading onto a truck, as the cylinder doesn’t come into contact with the loading edge. Also the Knickmatik cylinder is prevented from being damaged due to its position on the left which allows the boom to swing to both sides at full digging depth. Thanks to the automatic swing brake, locking of the upper carriage cannot be forgotten during transport. The machine is controlled with Terex Fingertip Control which is a new feature in this class at Terex. Particular focus was placed on ergonomics in all models; for example, the blade lever offers an integrated travel speed controller hence making it easy to level and dig. Easy access and combined service points are key elements for saving time on daily servicing. The engine hood opens wide, the daily inspections are directly accessible and can be monitored through gauge glasses. Direct fuelling from canisters without a hose is carried out quickly, as the filling port is conveniently accessible. The result is reduced downtime and service costs for the end customer.